"The sadness and desperation in the eyes of this poor baby is clear to see." For the past six months, this baby orangutan lived on a shelf. At just 18 months old, Bonika should have been with her mother. 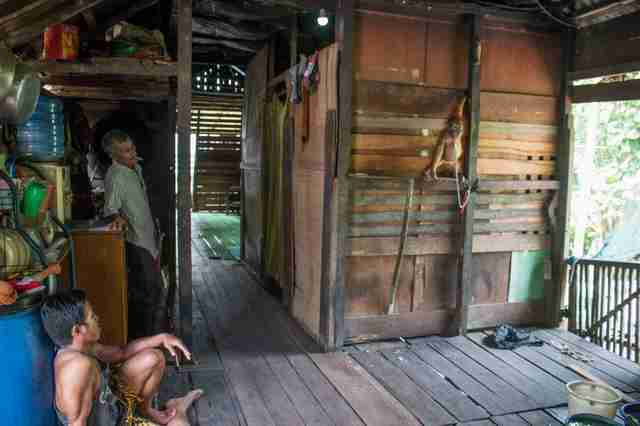 Instead, she was being kept as a pet by a villager in Borneo, who released her for a few hours a day to play with his child. 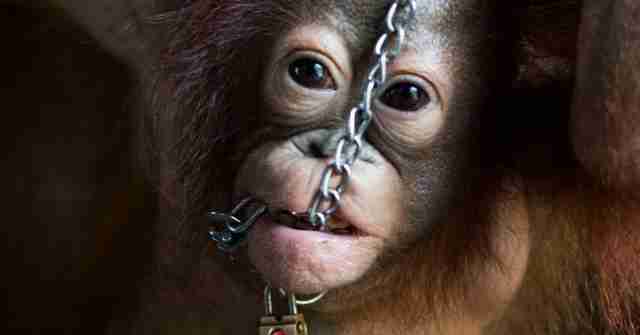 But the baby ape spent the rest of her time chained by her neck to the kitchen wall - often precariously balanced on the wall's wooden beams. 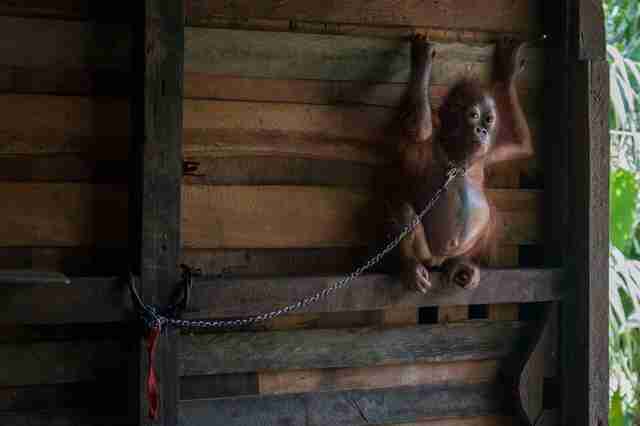 "She was chained so tightly around the neck that she was clearly in considerable discomfort," International Animal Rescue reported. "The length of the chain was also very short so that poor Bonika could barely move from side to side and was stranded on the plank." And, like most exotic pets, Bonika was malnourished. Instead of nursing from her mother, Bonika was fed a "dangerous diet of rice, sugar cane, biscuits, bread, mineral water and baby milk," IAR said. 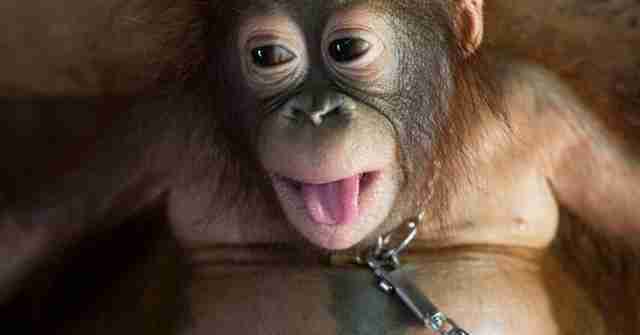 At some point, Bonika's owner realized keeping the baby orangutan was illegal. But he didn't know how to turn her over, so he kept her, continuing to feed her human food, washing her with shampoo like a human baby and chaining her up when she wasn't wanted. But fortunately, help was on the way. During a visit to the area, IAR's Human-Orangutan Conflict Team heard about Bonika and notified the rescue team, which rushed in to help her. When the team arrived, they found a "heartbreaking" scene - Bonika was chained to her wall, her little face peering out from the corner of her ledge. "The sadness and desperation in the eyes of this poor baby is clear to see," IAR reported. Bonika's owner told the rescue team that he had found her while walking to work one day and, noticing she was thin, captured her to take her home and care for her. But IAR suspects that Bonika's history is far sadder. "We are all delighted to have been able to rescue Bonika but also deeply saddened by the likely fate of her mother," Alan Knight, chief executive of IAR, said in a statement. "No mother orangutan parts willingly with her baby and Bonika's mother was almost certainly killed." But whatever she'd seen in her past, Bonika's sorry start in life was finally over, and her owner willingly turned her over to the team. "Please be assured that our team cut the tight chain and Bonika has been rushed to our centre for treatment and care," IAR wrote in an update. Photos show the little infant clinging to one of the women on the rescue team as she was carried away - finally freed from her lonely life on a shelf, and able to act like the baby she is. Bonika is currently in quarantine, but she will eventually be introduced to the other young apes at IAR's orangutan orphanage, and begin to learn the skills she needs to return to the wild one day. While the rescue is a victory for Bonika, it's also a victory for her species as a whole. As of July, both species of orangutan are classified as critically endangered due to overwhelming threats from the illegal pet trade and the palm oil industry, which is razing wide swaths of their rainforest home to make way for palm plantations. Some experts estimate that orangutans could be extinct within the next 10 years - and with those numbers, every individual counts. "Every animal we save is a triumph and every animal that dies is a tragedy," Knight said. "Babies like Bonika are our hope for the future - but it needs the will of all those involved in the orangutans' decline to commit to preserving sufficient habitat for these magnificent great apes to survive and to thrive." Fortunately, Bonika now has every chance of growing up strong. To help her heal - and provide for the many other baby orangutans IAR is raising - you can make a donation here.